The recent massive flooding in Western Japan from Kyushu to Gifu has made many of us living in Japan check the vulnerability of our own homes to severe flooding. One way to do this is to check the hazard maps published by local governments. As listed below, Shiga Prefecture has published online hazard maps for floods, landslides, earthquakes, and nuclear power plant radiation leakage. The hazard areas are color-coded and quite detailed (you can zoom in and scroll around your neighborhood). The green “running man” icon indicates refuge areas (parks, schools, etc.). 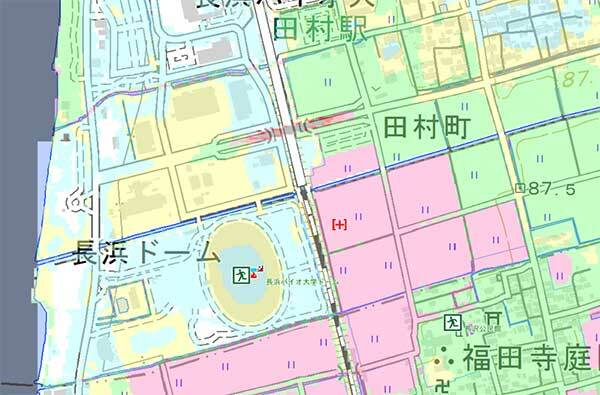 All the hazard maps are in Japanese only, no versions in English or other foreign languages. And so I’ll explain about these maps so you can have a basic understanding. We have to look at the maps as just a rough guide. It’s impossible to accurately predict how your neighborhood or home will be affected in a major disaster (especially earthquakes). The best thing to do is to be prepared. But it’s hard to be fully prepared for something you’ve never experienced or something that strikes unexpectedly. At the very least, always keep a stock of bottled water (at least one week’s worth), canned food and snacks, first-aid kit, and a hard hat. And whenever you go out, always carry water and snacks in case you get stuck on a train in an earthquake, etc. Aqua: Areas that can get flooded up to 0.5 meter. Yellow: Areas that can get flooded up to 1 meter. Green: Areas that can get flooded up to 2 meters (1st floor height). Pink: Areas that can get flooded up to 3 or 4 meters. Red: Areas that can get flooded up to 5 meters (2nd floor height). Shiga Prefecture has live cameras monitoring major rivers. They are connected online so we can see the river’s water level. On this map, click on a camera icon to view the camera’s river image online. The image is updated every 5 min. (It’s not a video.) The map also has icons indicating the water level. Blue is normal while red is the river’s flood warning level. This map highlights the areas in Shiga vulnerable to landslides. Mountainous areas where a landslide can occur are outlined by a brown polygon and filled with slanted, vertical, or horizontal lines. (These lines indicate the type of landslide.) The yellow areas show where the landslide can bury homes and property. Again, this map is only a rough guide. Heavy rains or prolonged rains can well expand the landslide or mudflow to cover a larger area than indicated in yellow (土砂洪水氾濫). (The landslide hazard maps for areas in Okayama and Hiroshima flooded in early July 2018 proved to be woefully inaccurate since the landslides affected a much larger area than shown on the maps.) If you live near a mountain, you need to be extra vigilant during and after heavy rains. This is an interesting map, but I wouldn’t rely on it too much. In fact, it might be pretty useless. There are just too many unknown factors, especially unknown earthquake faults. The two major earthquake faults known in Shiga are the Yanagase Fault (柳ヶ瀬断層) in northeastern Shiga in Nagahama and the Western Lake Biwa Fault Area (琵琶湖西岸断層帯) which is a series of faults along Western Shiga from Otsu to Takashima. The last major earthquake that struck Shiga was the Anegawa Earthquake (Yanagase Fault) in 1909 striking Nagahama (Torahime, Anegawa River area, and Gifu). It was magnitude 6.8 and 35 people died and 643 people were injured in Shiga. Over 2,000 homes in Shiga collapsed. Blue: Areas that may have a Magnitude -5 earthquake. Green: Areas that may have a Magnitude 5+ earthquake (bookshelves and cupbards falling over). Yellow: Areas that may have a Magnitude -6 earthquake (roof tiles may fall off, furniture falling over). Orange: Areas that may have a Magnitude 6+ earthquake (buildings can collapse). Red: Areas that may have a Magnitude 7 earthquake (buildings can collapse). This map shows a 30 km radius (in orange) from each nuclear plant in Fukui Prefecture. Of course, the radiation can spread beyond this radius depending on prevailing winds. Local officials are still trying to figure out how people can evacuate northern Shiga en masse in case of a major radiation breach in Fukui. If there is a major radiation leak, say good-bye to our water supply and endemic fish. People in Kyoto and Osaka will also suffer. And yet, big business and local politicians think it is worth the risk. 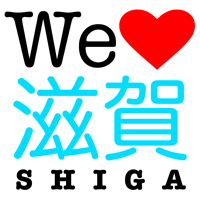 Organized index of my videos of Shiga Prefecture on YouTube. I currently have about 90 Shiga videos on my YouTube channel (photojpn). Mostly matsuri festivals. Links go directly to YouTube. 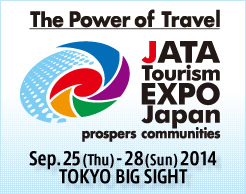 Great fun and entertainment at the huge Tourism Expo Japan trade show held on September 27-28, 2014 for the public at Tokyo Big Sight. 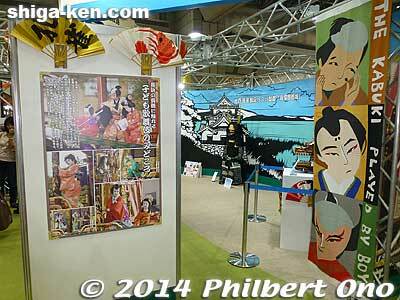 The expo had tourist booths from all 47 prefectures and 150 countries. A great place to pick up travel information, ask travel/sightseeing questions, see traditional Japanese crafts, and enjoy dances and entertainment from around Japan and the world. For the first time this year, they combined the domestic travel fair and the international travel showcase to create this new trade show. So it’s now one of the world’s largest travel/tourism trade shows. 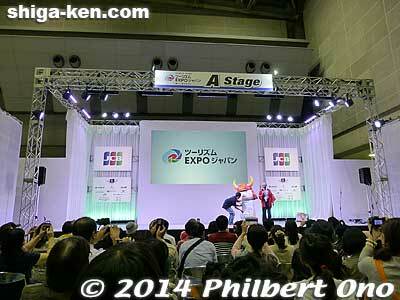 About 150,000 attended the expo (admission ¥1,300 for adults). Lots of local food and entertainment too. Besides three large performance stages to showcase Japanese dances and festivals, many booths had their own mini stages for cultural entertainment like hula dancers at the Hawaii booth. I thoroughly enjoyed the expo and hope to see it every year from now on. Regretfully, I didn’t get to see everything in one day. So much stuff and so many things going on. Shiga Prefecture had a medium-size booth and a 30-min. slot on one of the large entertainment stages. One of the food courts also held a donburi (bowl of rice with a topping) contest where Shiga had a booth. Sixteen donburi booths sold donburi from various parts of Japan for ¥500 and we could vote for our favorite donburi. Very popular place for lunch. 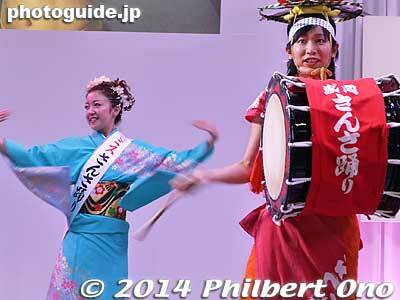 Here are some photos of Shiga at Tourism Expo Japan 2014. 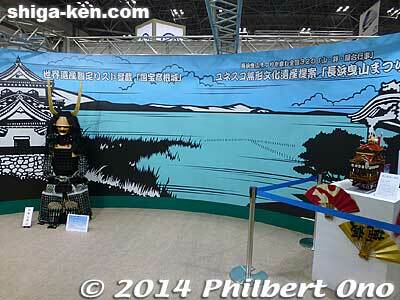 Shiga’s booth represented only Hikone, Maibara, and Nagahama. But I didn’t see anything related to Maibara. Even Otsu wasn’t there. No Lake Biwa, no ninja either. Very puzzling. Perhaps the other cities did not have the budget for a booth. Or maybe the cities are taking turns at this expo, which still doesn’t make sense. Shiga’s booth was mainly occupied by this space, supposedly for some kind of entertainment. But there was no schedule of who or what would appear. Hiko-nyan supposed to appear, but the staff I asked couldn’t tell me any specifics. At one small corner of the booth, they gave out brochures. Caffy was there too, but only sporadically. The booth’s emphasis was on Hikone Castle billed as on the “World Heritage Site Tentative List” which is really nothing to brag about. And Nagahama Hikiyama Matsuri being included in Japan’s application for inclusion in the UNESCO Intangible Cultural Heritage list (to join Kyoto’s Gion Matsuri floats). This is also nothing to brag about, not until it actually makes the list. Really couldn’t understand this booth. Nagahama Hikiyama Matsuri musicians on stage. Nagahama Hikiyama musicians on stage. Extreme left is the mayor of Nagahama. They all looked too serious and glum. On September 27, 2014, Shiga had a 30-min. slot on the large Stage A from 2 pm. First the mayor of Nagahama gave a short speech, then these musicians from the Nagahama Hikiyama Festival played while the large screen above projected a video of the festival. Nagahama Hikiyama narrator-singer was excellent. Nagahama Hikiyama Festival kabuki dancer (Sanbaso). 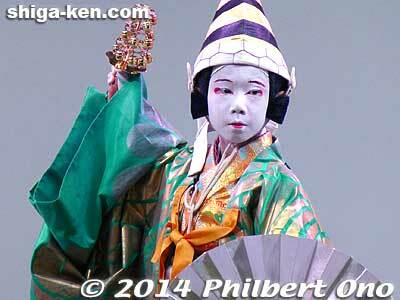 Following the Nagahama Hikiyama musicians, this young kabuki dancer performed with live narrator-singers. He was very good. But I wish there were at least two or three of them. 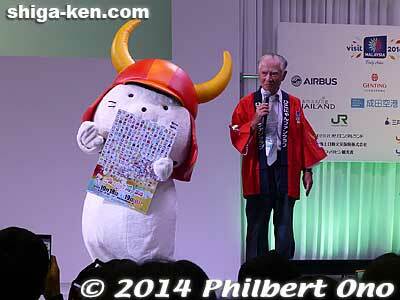 Hiko-nyan promoting mascot character festival. 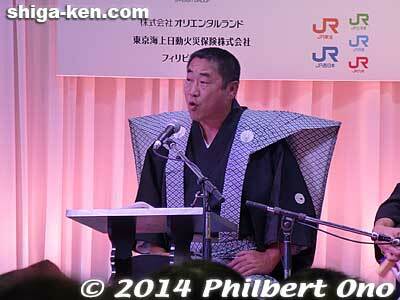 Following the Nagahama Hikiyama Festival introduction was Hiko-nyan’s appearance. Still a shutterbug’s darling, he only had to walk left and right on stage and pose for cell phone photos. Although Kumamon and Funasshi have overtaken Hiko-nyan in terms of fame and popularity, Hiko-nyan remains popular. Disappointed that nothing from Maibara was featured on stage. They should’ve brought Maibara’s taiko drum dancers. An eatery in Shiga had this donburi booth (left) for lunch. 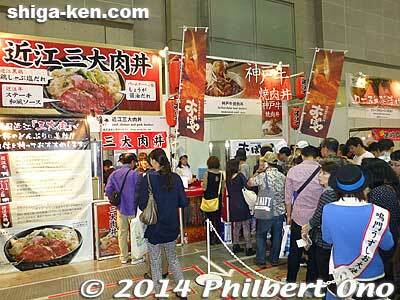 Unfortunately, it was right next to the super popular Kobe beef booth (right) which always had long lines. 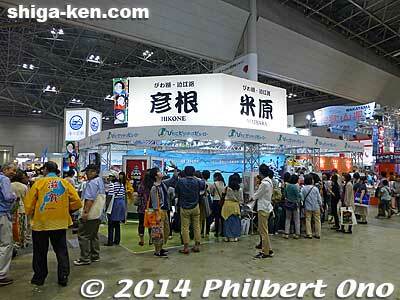 As you can see, the Shiga booth wasn’t crowded at all. 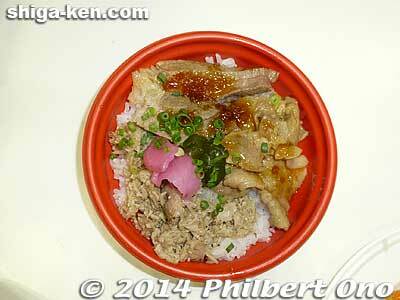 It served a rice bowl with a topping of Omi beef, pork, and chicken. The expo had a traditional crafts area with traditional crafts people giving live demos. Shiga had two two crafts booths. One was this Hikone butsudan (Buddhist altar) maker. I had a nice talk with this master craftsman from Hikone. He builds the altar doors. The sculptured wooden parts are made in Maibara (Samegai). He makes several hundred butsudan every year. He even makes altars for Buddhist temples and repairs butsudan too. Seems very busy. He said I could visit and see him work in Hikone. Yep, I will do so. 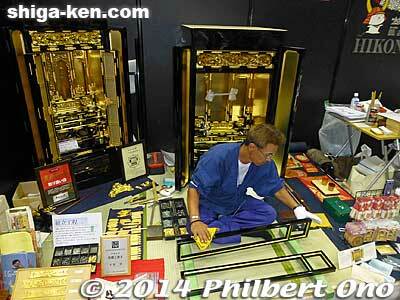 The butsudan on the left behind him showed a price tag of 1,641,600 yen. 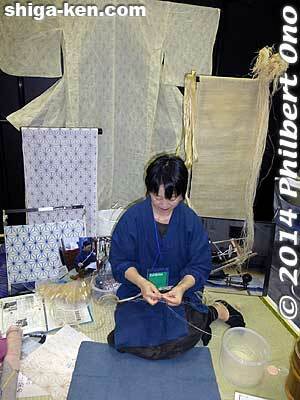 Besides the butsudan maker, there was a booth for weaving Omi jofu (hemp cloth) from Aisho. Happy to see not one, but two crafts people from Shiga. You could try and weave the cloth yourself. Miss Sansa Odori from Morioka, Iwate. 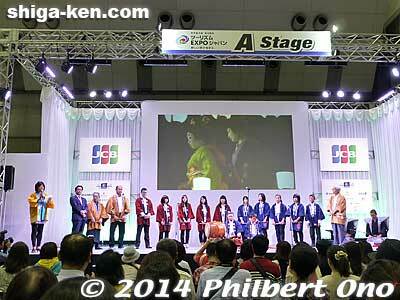 I wasn’t too impressed with Shiga’s booth and stage presentation. 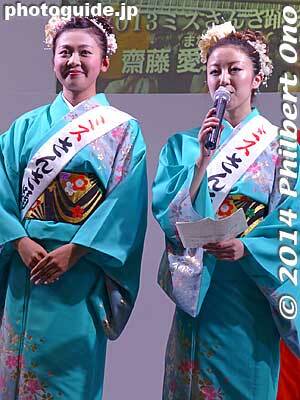 They need to have better spokespersons on stage like these two Miss Sansa Odori from Morioka, Iwate Prefecture. They had bright, smiling faces and a welcome tone of voice. Not only that, they could dance too. Sansa Odori is a native dance of Morioka performed in August. 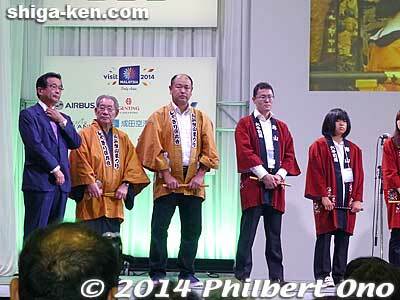 The tourism expo was like a virtual tour of Japan at one place. Highly recommend it. Sansa Odori dancers from Morioka, Iwate.